Got a cracked screen on your phone? Everybody uses a smartphone or tablet. And at one time or another, you break these gadgets unknowingly. Be honest. Have you ever used a phone with a cracked screen? If so, you’ve engaged in unprotected text, a very risky activity. But all is not lost. As a part of their Stop the Spread of #unprotectedtext campaign,Gazelle is giving you the opportunity to bare your soul on their Facebook page! In 50 words or less, share your story about how you broke your phone and why you continued to use it. How was your experience in using a cracked screen? Be sure to use hashtag #unprotectedtext and @Gazelle in your social post. 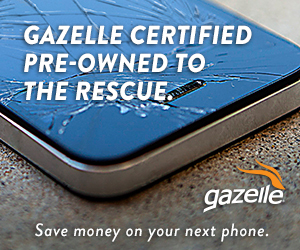 When you post, you’ll be automatically entered to win a Gazelle Certified pre-owned iPhone or iPad. The Sweepstakes ends on July 15, 2015, at 11:59:59 PM ET. Open to US residents, 13+ years old. Now is your opportunity to help stop this epidemic from spreading! Instead of using a cracked screen, you can now get a certified gadget.